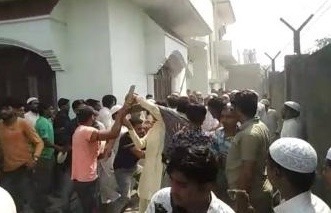 A fight broke out at the Tandhera village on Saturday over distribution of biryani during the election meeting of Congress candidate from Bijnor, Nasimuddin Siddiqui, police said on Sunday. “Clashes broke out in Tandhera village on Saturday during the election campaign of Congress leader as people scrambled for food being served at the venue. We investigated the case as it was a violation of model code of conduct,” senior police officer Alok Sharma told media persons in Muzaffarnagar. In a video of the incident tweeted by news agency ANI shows people shouting at each other with some of them even slapping and hitting each other with sticks. The election meeting was organised at the residence of former MLA Maulana Jameel. Biryani was served without taking necessary permission from the officials, people scrambled around to get the first plate. When the police reached they resorted to Lathicharge to dismiss violent gatherers. An FIR has been registered against seven to eight persons and further action will be taken, police said.